One of my many duties around here is to help out with laundry. I think I was elected as a helper because of my love of dirty clothes! Mommy is taking her time and being lazy today, but I'm here to remind her that it needs to be done! She should certainly put off doing the laundry until your nap is over at least! Is that a pink polka dot bikini you are laying on? Sam just be careful Mum doesn't put you in the washer!! We can understand putting it off, that spot looks cozy. 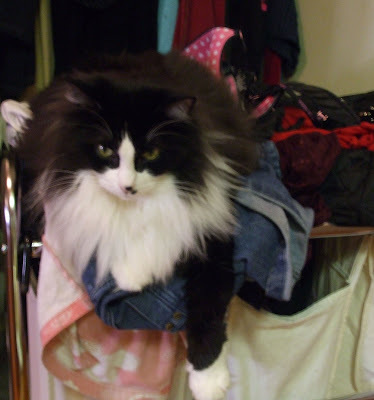 We love dirty clothes too, and freshly clean ones to cover in furs. Do you coat the clean ones in Samson furs? We gots a huge pile of laundries on the dining room table this morning. Can you come help us fold it please? We won't be able to eat dinner if it stays there all day (which it will do if left up to our ZH). Haha! We hope your mom doesn't think your part of the dirty clothes, Samson! Surely she wouldn't disturb you! We agree, better to put it off for a while. We usually prefer clean laundry, but that dirty laundry looks so comfortable that we might try it too! We were wondering when Sunday turned into laundry day. It is at our house, too! . Yes, I bet those clothes have all kinds of nice smells on them, too. They probably remind you of your mama! My kitties love to sit on my clothes and knead them. Samson, you are just too adorable for words! We love lazy. Sam please tell you mommy that you got an award (lili) from Jasmin and we are passing it on to you. Don't do the laundry until you're god and ready, Samson! Samson, you are looking so clean and floofy. I just want to pet you so bad! And I think you are doing a fine job of helping with the wash. Melvin just tries to jump in the dryer whenever he "helps". Concatulations! You won our very first giveaway!! We will be emailing you shortly for your mailing address and product choices! You poor boy! Laundry is a hard job! My mom is lazy today! She stays up too late! We like clothes piles too - dirty or clean. I like the empty laundry basket! I love a clothes pile, daddy's when dirty and mom's when clean. Skeeter LOVES sleeping in the hamper of dirty clothes! (She's kinda gross!) Especially when our Dad gets home from work and takes off his sweaty, smelly socks and she just rolls all over them! Ewww.... Hope you enjoyed your LazyDay! 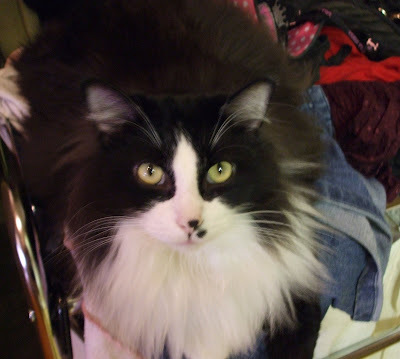 Samson, you are just like our tuxie Kirzon - he loves laundry too - dirty or clean he will sleep in it - very much like you are in that last picture!